← Stillness and bird chatter begin the day .. There is one truth that I discovered in the past year : I am healthiest when I spend time in the water. Surfing has quickly become the water connection of choice. I think it’s because of the intimacy, the complete identification of self with water that happens with a swell under my feet. The waves are my Zen – my soul space – my sanity. I know that I’m not the first to have this experience, nor will I be the last. Thousands of surfers would attest to the sense of timelessness that happens when they paddle into a wave, feel the power generated by winds sometimes thousands of miles away, move and change their lives. I had surfed when I was a teenager, and then some time spent in Hawaii. But when I returned to the states, I ran into some really agro male surfers who pushed me off waves, cut me off – basically tried to convince me that they owned the water. And I guess they won. I went to college, worked three jobs, and then an inland marriage carried me within visual sight of the water, but a long drive through crowded freeways. Someday with luck this will be me ... such beauty! It took a major upheaval in my life – to not coax me – but throw me back into the water to find myself, my voice, and my sanity. Now, there’s not much to keep me out of it. I’ve broken my nose on my own surfboard – and found my way back into the water six days later. I’ve got fin cuts, bruises, and rock slices on my feet. Doesn’t matter. Doesn’t stop me. Now, when I run into agro guys, I first try to befriend them – if that doesn’t work, ignore them – and at last jump, just surf alongside of them. The waves are free …. the waves are free ….. 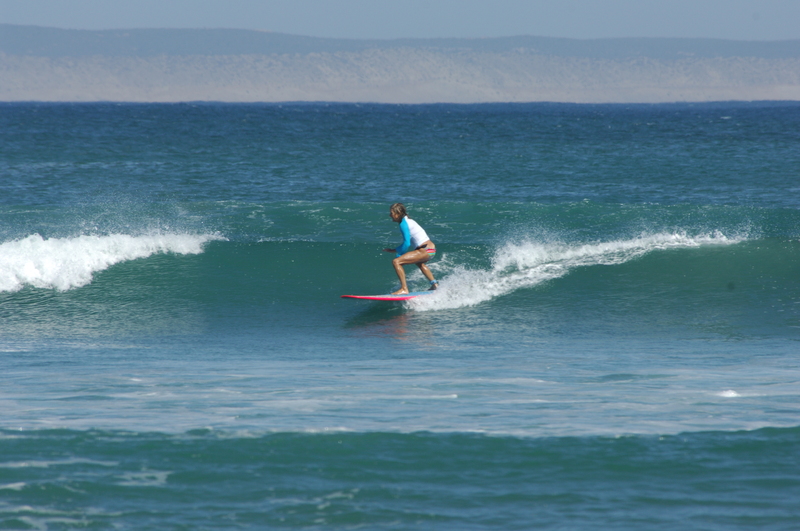 This entry was posted in Surfing and tagged San Juanico, soul space, Surfing, zen. Bookmark the permalink. Catharine, I call her surfer girl, she has found the girl in her that takes her out to surf even in cold wind, cold water, I see her sparkle and shine, she looks so tiny out there, she smiles all the time, her delight is mine….